Whenever I build a new machine, one of the first things I do, is open Regedit > Go to HKEY_CLASSES_ROOT > lnkfile and remove the “IsShortcut” Value, and voila! the annoying shortcut arrows are gone. If you do, you will notice that you can no longer add shortcuts to the “Windows Explorer Favorites” (well you can but you can’t see them), also it disables (Grays Out) the Expand option for Favorites. It took me ages to find out that my registry hacking had caused the problem. so I put the registry key back again (restore it with this). I even tried to use FxVisor to remove the shortcut arrows, and that didn’t work either. 3. Navigate to C:Icons and run the RemoveArrow.reg file. 6. Reboot – Arrows are gone. 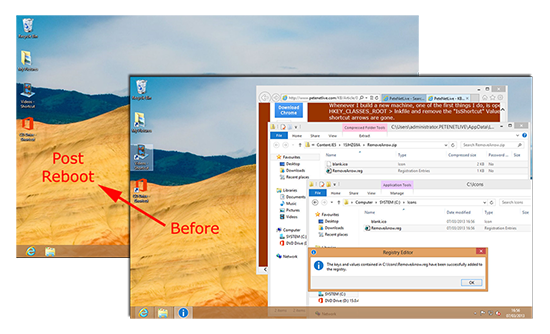 Tried your method to remove the Shortcut Arrow from the desktop icons in Windows 8, using RemoveArrow.reg but how have a blank white document image on top of each icon, which look worse an the arrow! How do I change them Back. – Well I dont’t want to be the guy who breaks stuff! So I tested the procedure again an a fresh Windows 8 Box.